I had to walk through a shopping mall the other day, although to be honest, I usually try to avoid them. There were escalators rising up through the inside of the multi-level structure, walkways circling around the perimeter that drew people into shops. There was the hubbub of thousands of people; many carrying multiple bags with large logos proudly announcing a store or brand. 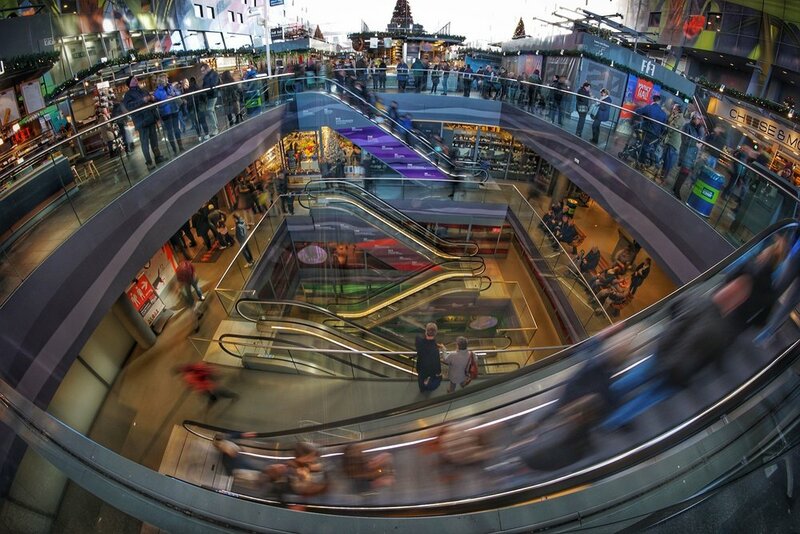 The shopping mall seems a fundamental anchor of the modern retail experience. But did you know that they weren’t intended to be? What we know as the modern shopping mall creates quite a different experience from its original vision. The vision behind the shopping mall had good intentions, but changed dramatically when it met a set of opposing incentives. The modern shopping mall was invented by Victor Gruen in the rising economic powerhouse of post-war America. As one of the many immigrants who had fled Europe during the war, Victor sought new opportunity in the land of plenty. After following a number of eclectic career choices, including working as a musical performer, he seized hold of a series of opportunities to design several stores. With this newfound experience, and with a significant amount of confidence, Victor set about changing the face of America. His landmark design was the very epitome of the large scale shopping mall. It was the Southdale Center, built in Minneapolis in 1956. With carparks and nearly a hundred stores, it is the template for nearly every single mall today. Others soon borrowed the idea and soon there were hundreds and then thousands of shopping malls across America. Here is where the story turns. Victor Gruen never set out to build a shopping focused experience. Instead, he had an idealistic vision to bring the best of the European market square to America. He wanted to get people out of their cars; get them walking. He envisioned malls as having fountains, places to sit and talk; to create spaces for community interaction and energy. All within a single climate controlled space. I’ve sat in many of those European town squares. They struggle with the new burdens of tourism, gangs of disaffected youth and graffiti. Yet, you can still see people gather in the evenings. A couple of years ago, on a trip to Italy, I spent an evening in a town square outside Milan, watching families and friends meet after dinner. To drink coffee, read, sit and talk. At one point a small band assembled and began to rehearse outdoors for everyone to hear. The richness of a community depends on these sorts of spaces and the chance encounters they create. I very much understand the intention, but what happened along the way to Victor Gruen’s dream? Well, the dream was adopted by people like Victor Teubam, a contemporary of Victor Gruen and a store designer. On the surface, Tuebam’s changes to the base concept seemed to significantly enhance the experience of shopping. Parking was arranged up several levels, lights were introduced to brighten spaces once dusk fell. Archectiture began to consider store frontages and synergies between stores. However, all of these innovations were in service of a significantly different set of incentives. Victor Teubam’s approach to malls kept people circulating like fish; spending money constantly along the way. A modern mall is no different, with relationships between shopping entertainment (like bars and cinemas) ensuring people never need to leave. There is an incredible efficiency in the way you can extract money in a mall. Paired with a radical revision of how developers could make money on malls with rapid tax depreciation, the concept boomed. The creation of community, which no doubt includes healthy commerce, was Victor Gruen’s original dream. This is not the same as the design of an inward turning space that encourages shopping as a means to an end. This seems distant from the community spaces Victor Gruen hoped they would be. Before his death, Victor Gruen returned to his native Europe, disillusioned with how his vision had been both adopted and altered. It just goes to show that the best design intentions only come into their own when they align with the right incentives. Fit good intentions to opposing incentives and the outcome may be terribly disappointing. Bryson, B (1994), Made in America, Secker & Warburg.